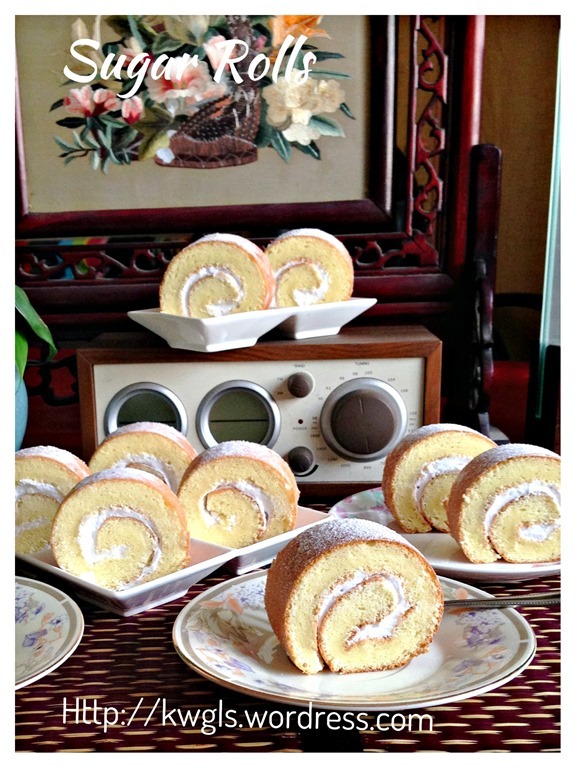 I have one post on Swiss rolls previously but as I have used the wrong baking tray, my Swiss rolls were rather thin and I have never ever promoted that post. 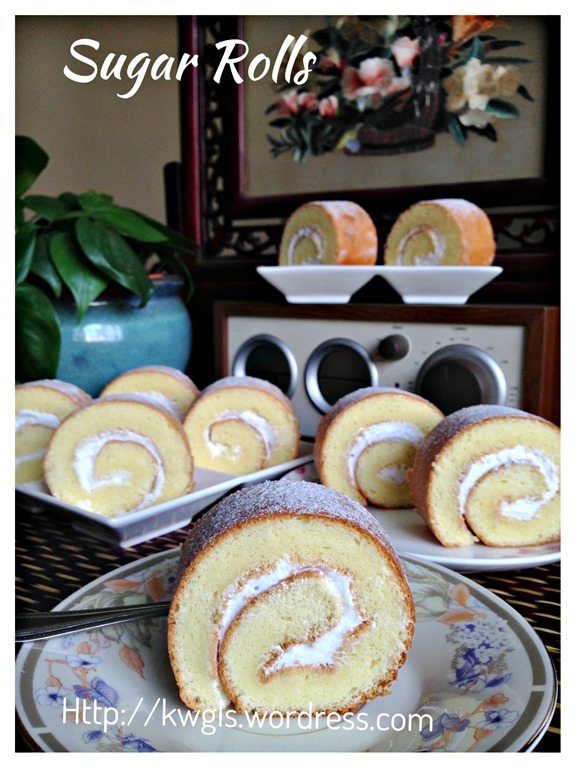 However, if you are keen to have a look, you can refer to Vanilla Swiss Rolls. After that trial, I have decided to buy a tray specifically for Swiss roll. 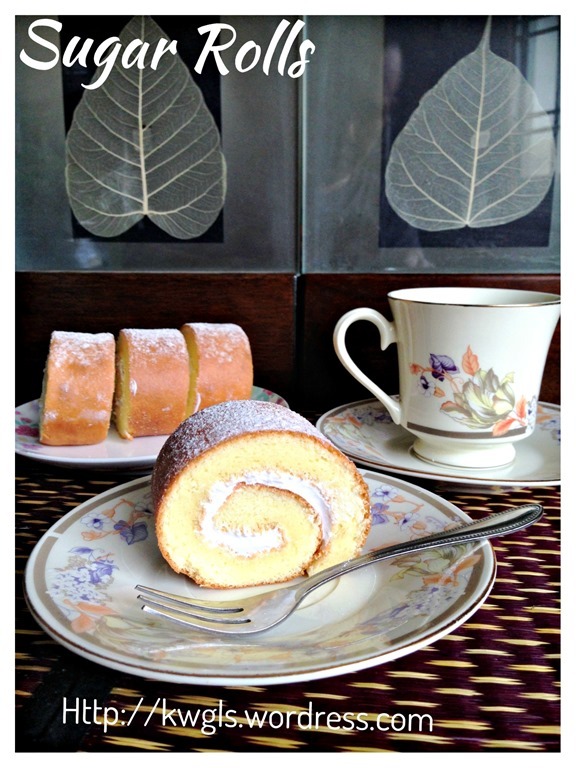 Today, I have tried another rather simple recipe from one of my favourite blogger, Aunty Yochana’s Sugar Roll Recipe recipe. 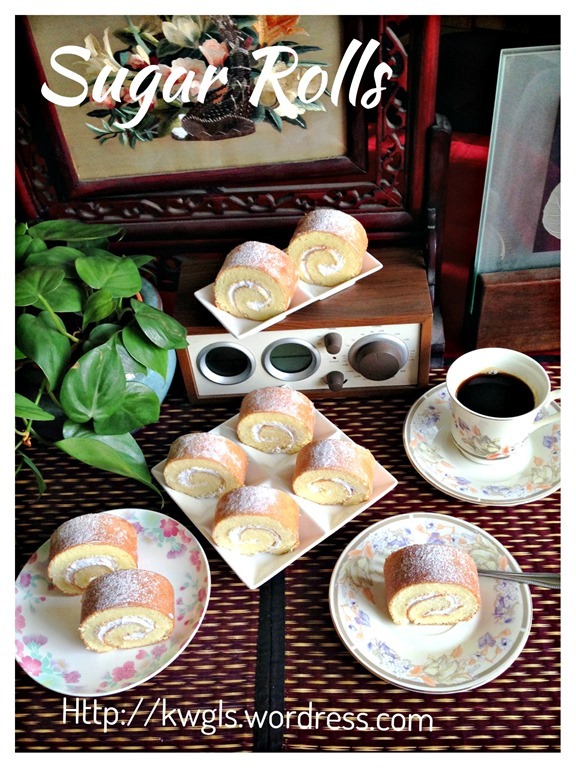 Her Swiss Rolls look good and her ingredients and method are simple . That sums up the reason that I am trying out her recipe today. Yes, the recipe did not fail me. It yields a soft and fluffy Swiss Rolls that I am looking at. Kids were fighting for the Swiss rolls after I have ended my picture taking session. Some friends are telling me that their Swiss rolls always cracked and asked me for a reason. 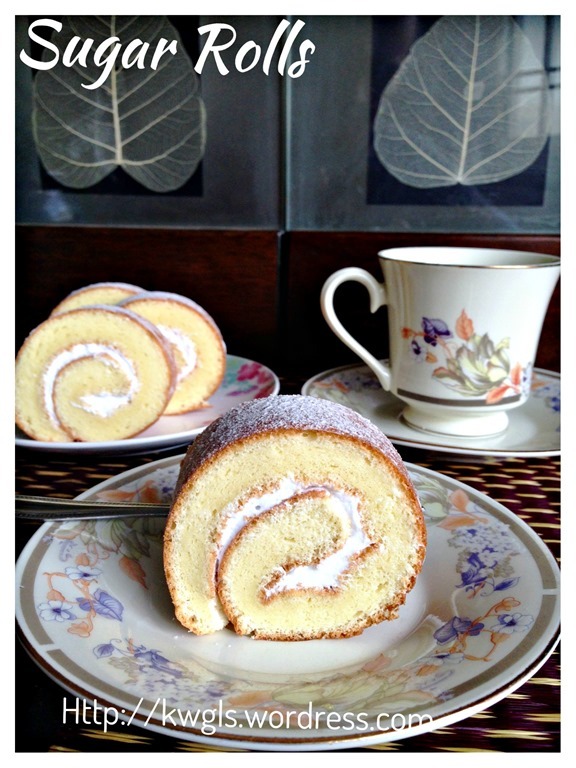 Very frankly, I do not know, most of my time, my Swiss rolls did not crack. Cracking, in my humble opinion, will mean the cake is too hard or dry and that could be due to: recipe problem, did not roll the cakes when hot to warm and finally, over bake the cake. I did not even take any special precautionary measure in rolling the cake. I just roll the cake as long as my hand can handle it. 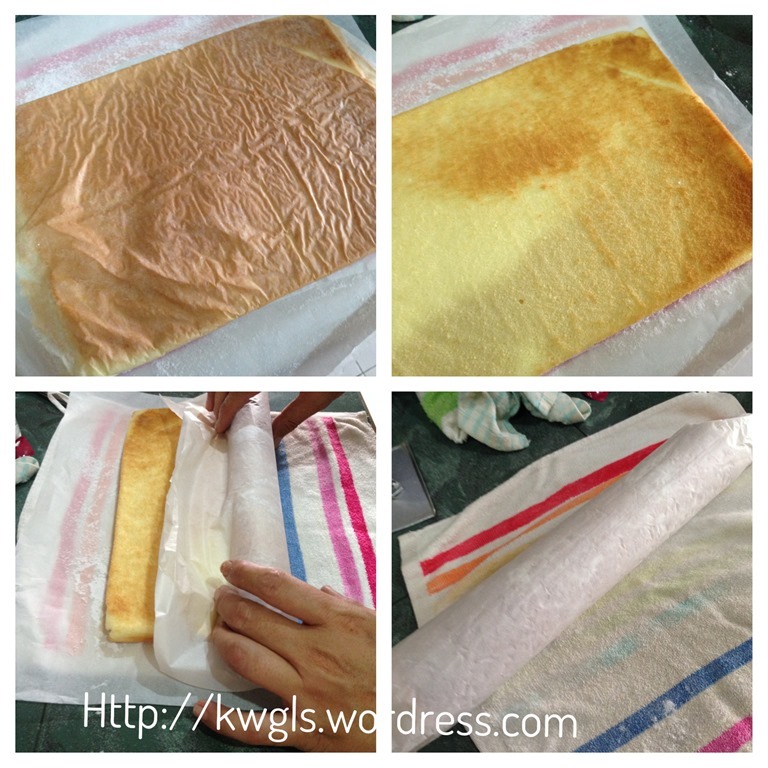 I found that the cake is rather spongy and easy to roll without much a problem. 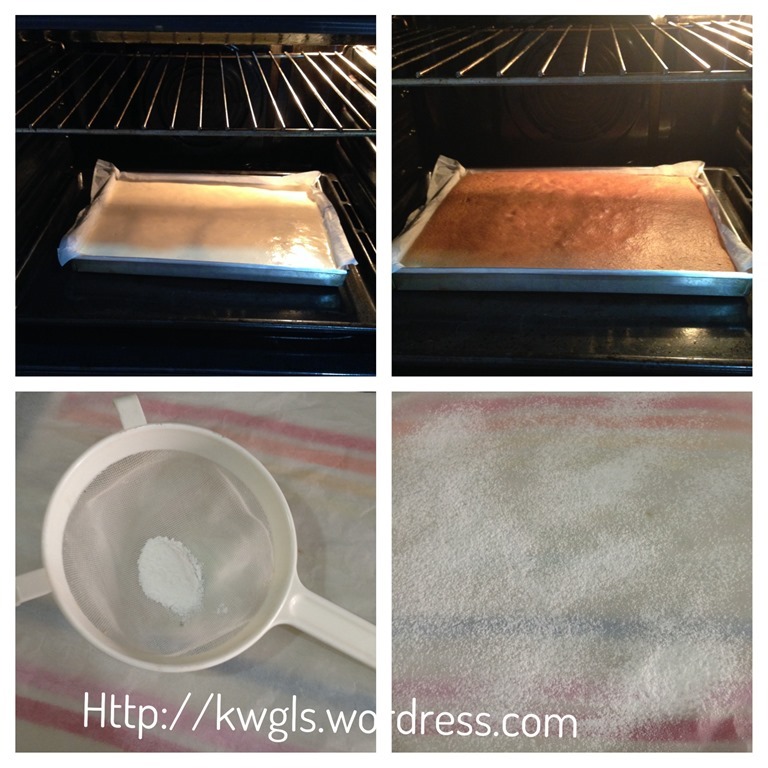 Line a 9” x 12” baking tray with baking paper. Get another one more piece of paper which is about at least 2 cm longer than the first baking paper. 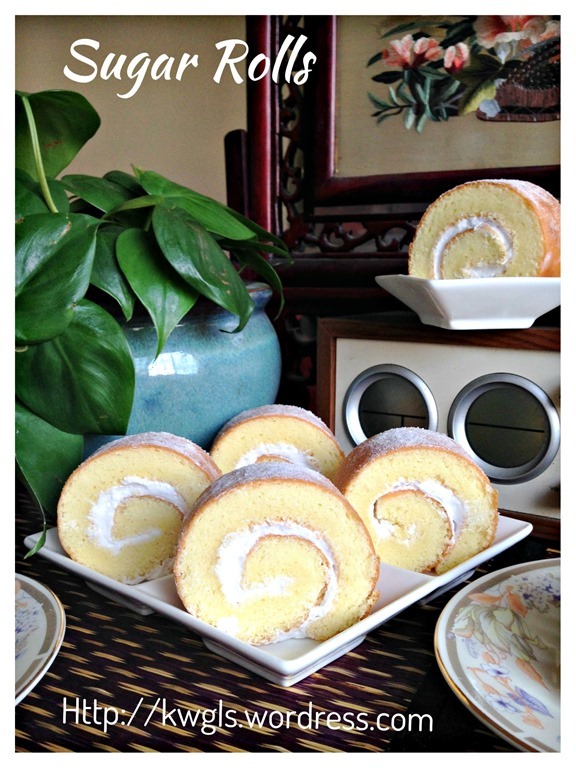 Set aside for later use after the Swiss roll is baked. 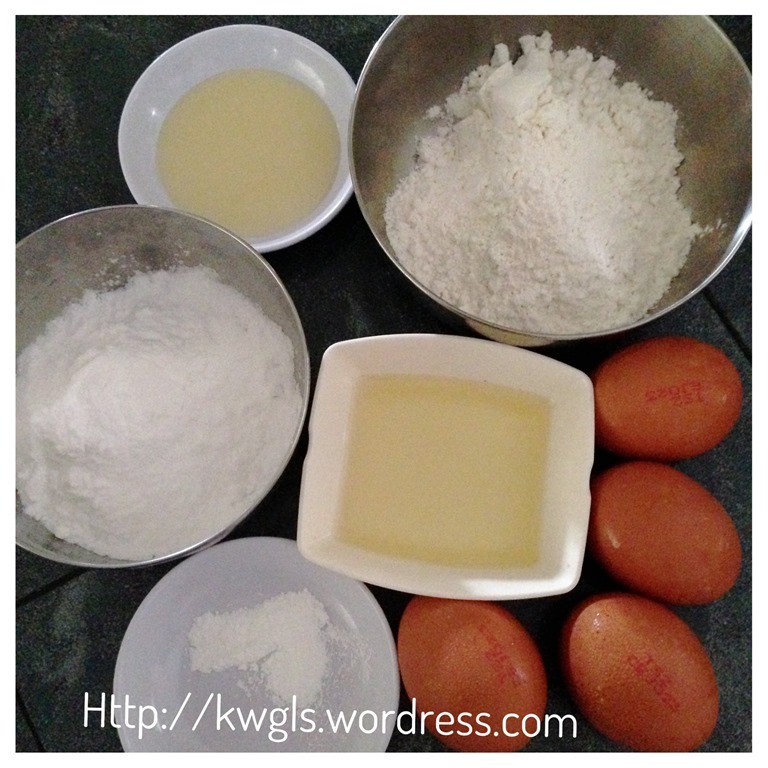 In a whisking bowl, put the egg whites. Beat the egg whites until foamy, gradually add in the icing sugar tablespoon by tablespoon. The egg white will expand and reach the soft to hard peak in 2-3 minutes. 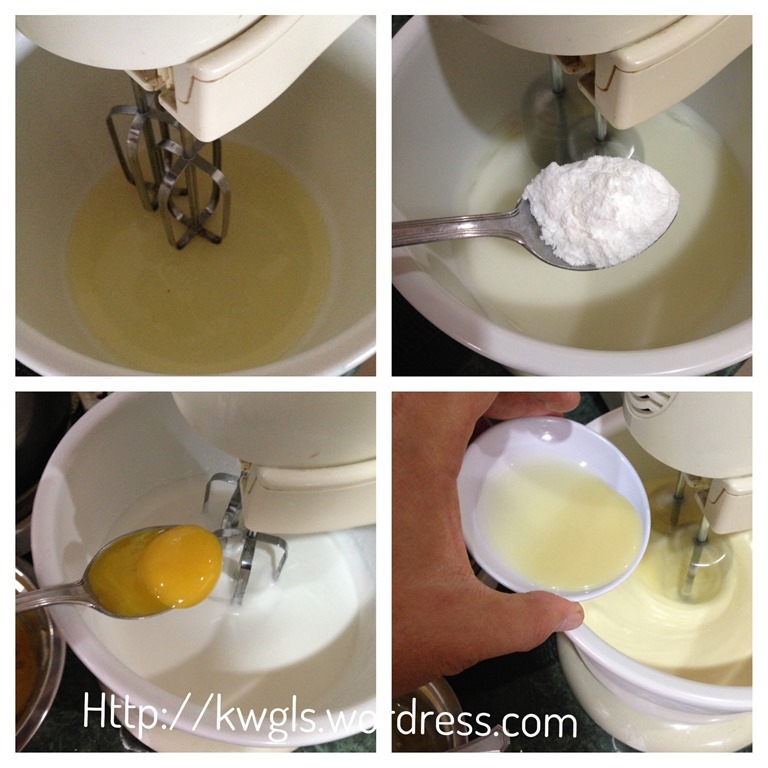 Add in the egg yolk one by one and follow by the condensed milk. Beat for another 3-4 minutes. Stop the machine and sift the baking powder and cake flour into beaten eggs. Fold carefully until well mixed. Add in the corn oil and fold in until well combined. 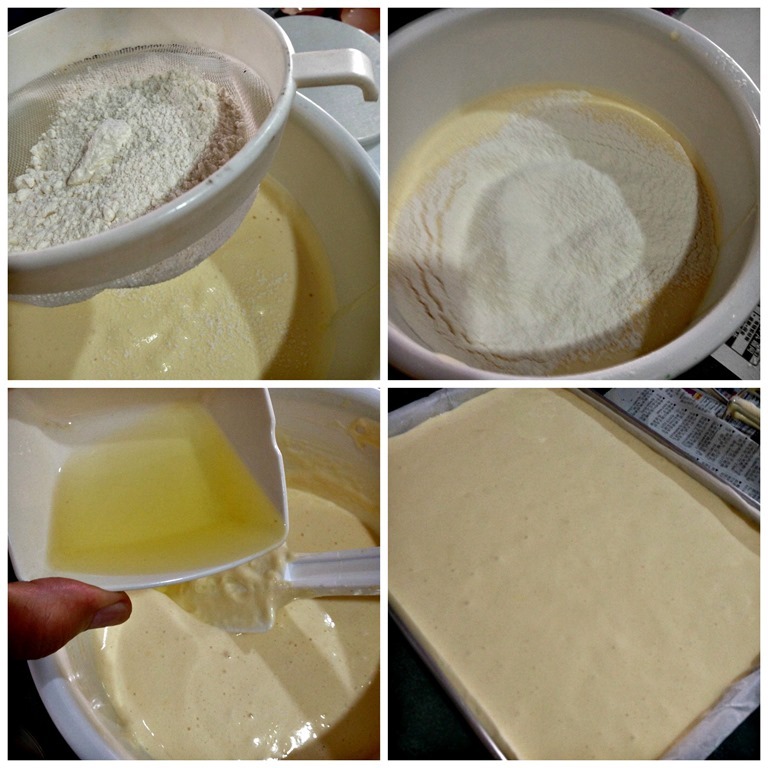 Transfer the batter to the baking tin. Bake in the pre-heated oven of 200 degree Celsius for 10-12 minutes until the top turn golden brown. Meanwhile, get ready the other piece of baking paper, dust some icing sugar on top of the baking paper. While the cake is cooling, beat the fresh cream with icing sugar until hard peak. Set aside for later use. Keep in the refrigerator if the cake is not ready and weather is hot. Once the cake is completely cooled, open the Swiss roll and spread the cream on the cake, roll it back and dust with additional icing sugar. 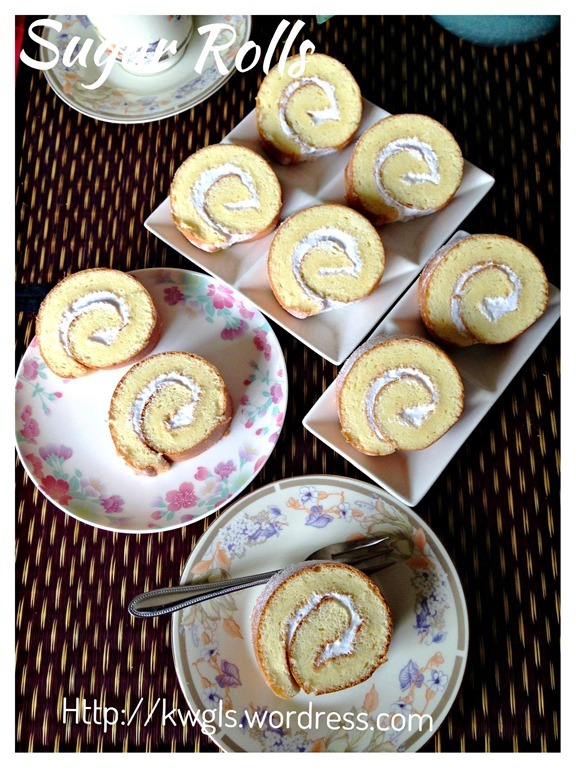 Cut into 2 cm thick and chilled the Swiss roll before serving if necessary. As you can see, I did not take precautionary measures in rolling the cake. Therefore, I believed that it is the credit of the recipe . 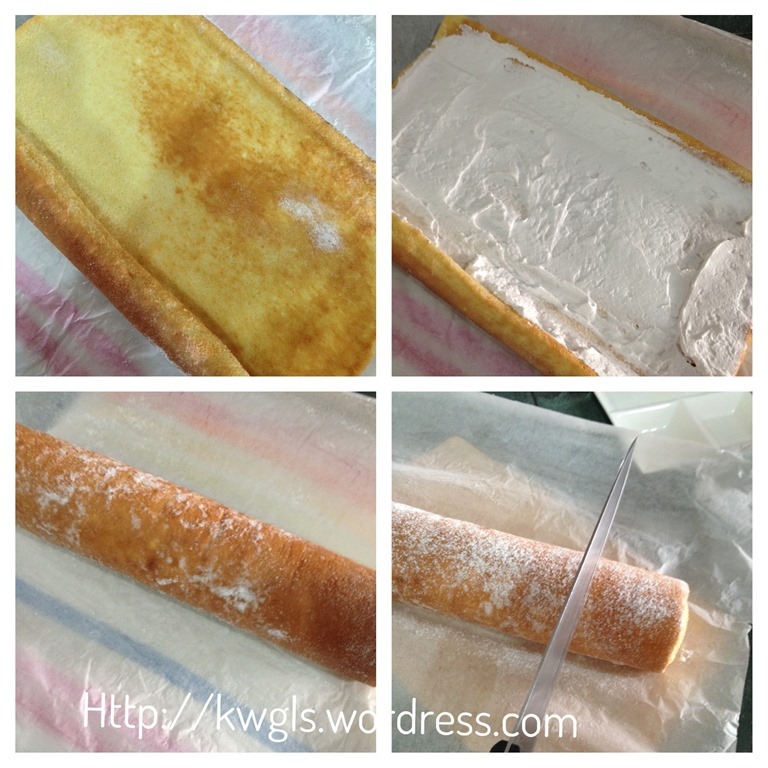 The cake is very spongy, fine texture and easy to roll. Do give it a try and most important of all, roll your cake as soon as your hand can handle the heat when the cake is out of the oven. You can also join the FOOD BLOGGERS AND FOODIES UNITED FACEBOOK GROUP to see more recipes. Currently there are about 8,800 members sharing various food photos . I am posting my daily home cooked food in the above Facebook Group daily. I would be more than happy if you can post in the Group for the recipes that you tried from my blog. 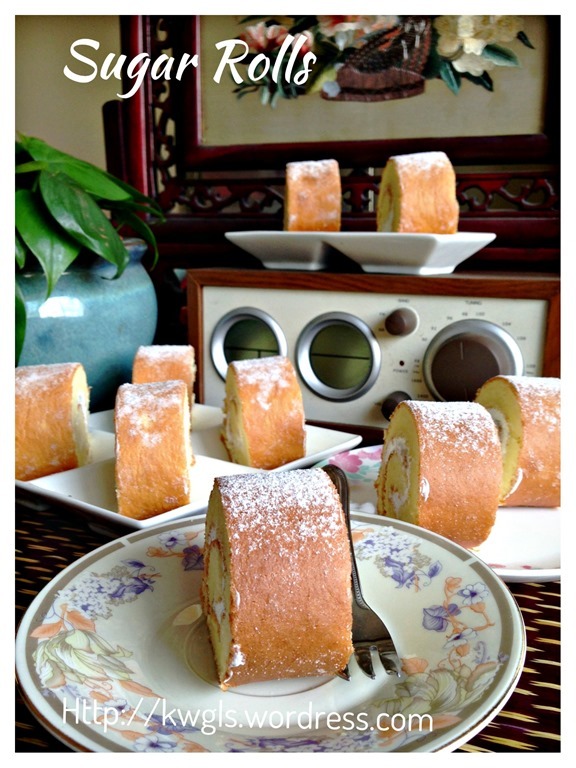 This entry was posted in Cakes and cookies, Food Preparation Series and tagged 瑞士卷， Sugar rolls, GUAI SHU SHU, Guaishushu, kenneth goh, polar swiss rolls, postaday, swiss rolls. Bookmark the permalink. Hi Kenneth, if I want to make it into coffee swiss roll using your basic recipe, can I just add in the instant coffee with hot water mixture ? I presume you can. Coffee paste is the best but a thick instant coffee mixture is acceptable. Thanks for yr prompt reply. At which part can I start to add it? This looks perfect, Kenneth! I would love a slice! I only have 10 x 15 baking sheet, will it work? 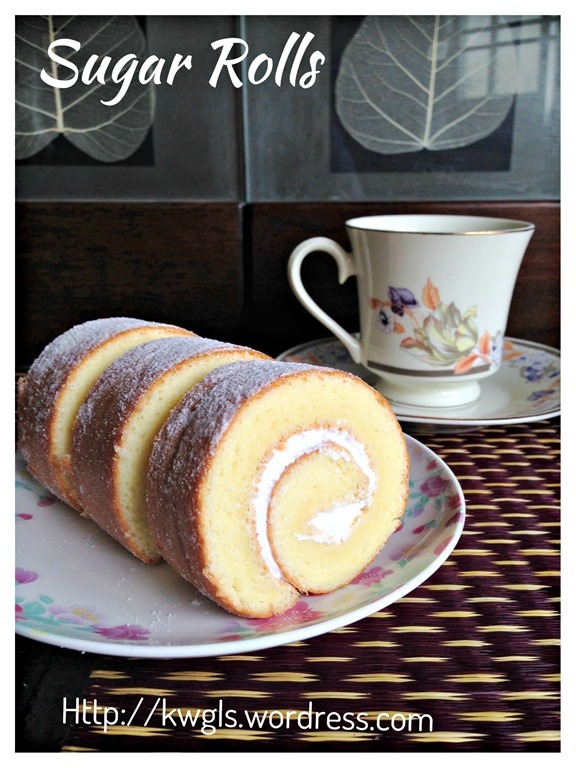 Your Swiss Roll looks pretty and delicious! Mungkin tidak Boleh, tak pernah Cuba . 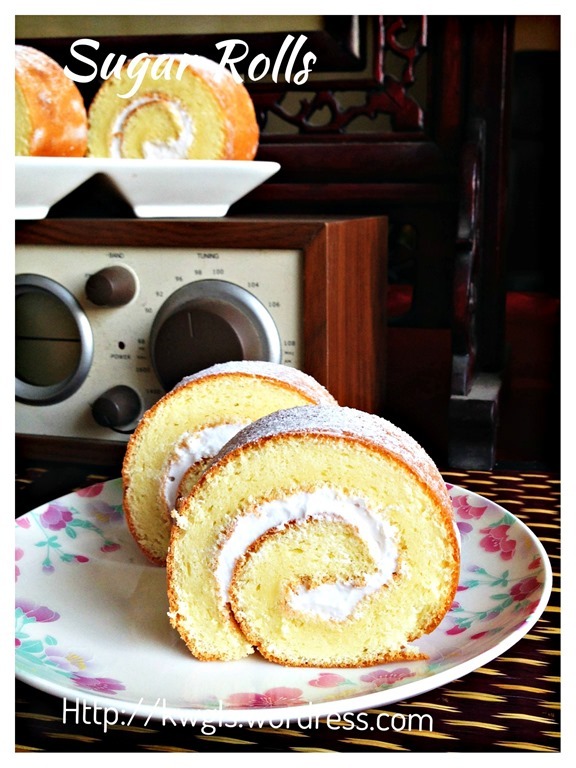 Hi Kenneth, what other type of cakes can be bake using this recipe, other than swiss roll ? Hi Kenneth, can I do without the condensed milk? Any other option to replace condensed milk. 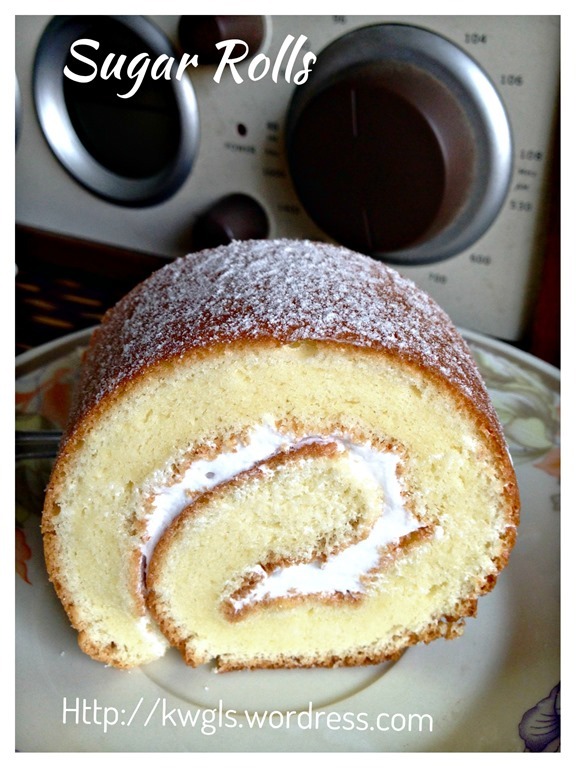 Advise not at all… Condensed milk has its important role of binding cake and make it creamier.. 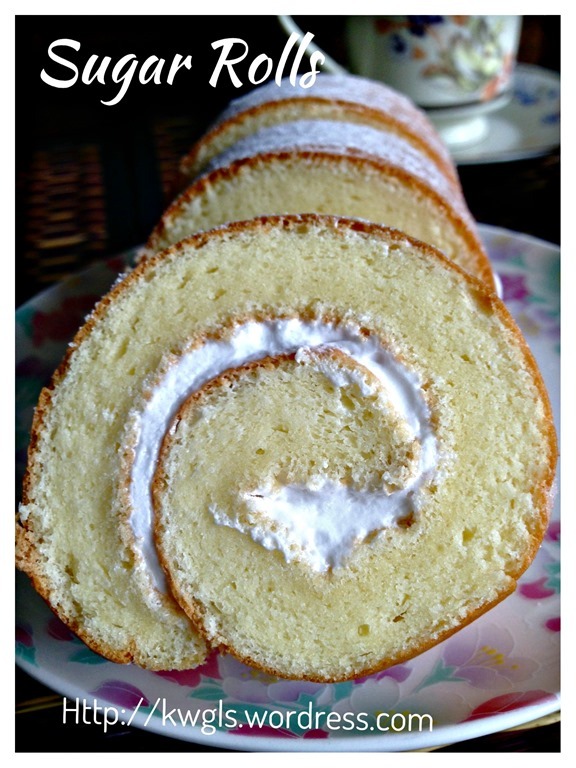 I have that size of baking sheet 9″ x 12″ I always thought it’s too small for a Swiss Roll, so I never used it, I always use my 10″ x 15″ Thanks for your recommendation, now I can try baking your Swiss Roll using it. It is just a bit thicker.. Your condensed milk is sweetened or non-sweetened here ?